SHOP TALK MMS FEBRUARY 2018 50 mmsonline.com Industry News MAKE YOUR MACHINE W ORK SMARTER n Tell you that a worn spindle bearing is about to cause catastrophic failure? n That a cutter is near the end of its life? n Assist in documenting product quality? n Intelligently adjust feed rate to compensate for material variations? With Artis and Brankamp machine and process monitoring solutions from Marposs, your machines work smarter and Industry 4.0 becomes a reality. 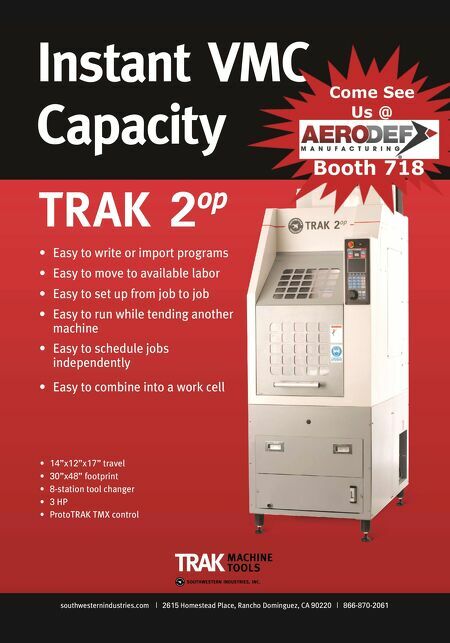 Improve productivity, enhance quality, safeguard operations and reduce cost on a broad range of machine tools . 1-888-627-7677 or www.marposs.com/MonitoringSolutions Artis/Brankamp Part of the MARPOSS Group of Companies What if your machine tool could talk or perform the following, in real time? 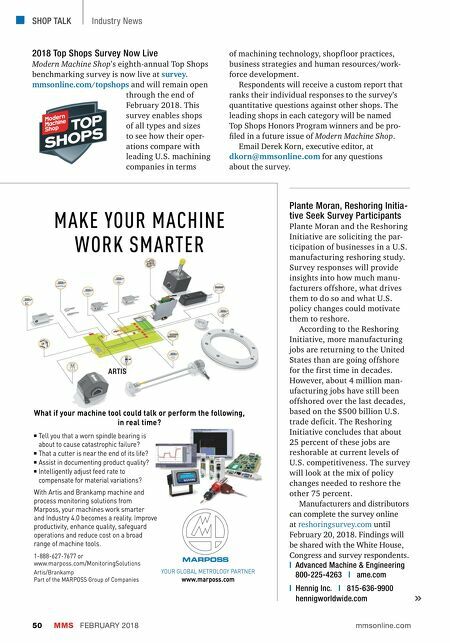 YOUR GLOBAL METROLOGY PARTNER www.marposs.com ARTIS 2018 Top Shops Survey Now Live Modern Machine Shop's eighth-annual Top Shops benchmarking survey is now live at survey. mmsonline.com/topshops and will remain open through the end of February 2018. This survey enables shops of all types and sizes to see how their oper- ations compare with leading U.S. machining companies in terms Plante Moran, Reshoring Initia- tive Seek Survey Participants Plante Moran and the Reshoring Initiative are soliciting the par- ticipation of businesses in a U.S. manufacturing reshoring study. Survey responses will provide insights into how much manu- facturers offshore, what drives them to do so and what U.S. policy changes could motivate them to reshore. According to the Reshoring Initiative, more manufacturing jobs are returning to the United States than are going offshore for the first time in decades. However, about 4 million man- ufacturing jobs have still been offshored over the last decades, based on the $500 billion U.S. trade deficit. The Reshoring Initiative concludes that about 25 percent of these jobs are reshorable at current levels of U.S. competitiveness. The survey will look at the mix of policy changes needed to reshore the other 75 percent. Manufacturers and distributors can complete the survey online at reshoringsurvey.com until February 20, 2018. Findings will be shared with the White House, Congress and survey respondents. | Advanced Machine & Engineering 800-225-4263 | ame.com | Hennig Inc. | 815-636-9900 hennigworldwide.com of machining technology, shopf loor practices, business strategies and human resources/work- force development. Respondents will receive a custom report that ranks their individual responses to the survey's quantitative questions against other shops. The leading shops in each category will be named Top Shops Honors Program winners and be pro- filed in a future issue of Modern Machine Shop. Email Derek Korn, executive editor, at dkorn@mmsonline.com for any questions about the survey.